Printed NCR sets and forms at competitive prices without compromising on print quality or service? Then you have come to the right place. Single or double sided 1 or 2 or full colour printing. Page colour order — white, yellow, pink and green. A5 and A4 sizes available on all duplicate forms. 50 sets per pad with 3 parts. All of our NCR forms are litho printed to eliminate the possibility of damage to your printer. NCR stands for no carbon required, a process used on all carbonless business forms. The NCR paper has a coating of carbon on its surface eliminating the need for separate sheets of carbon inserted between the top and subsequent copies. 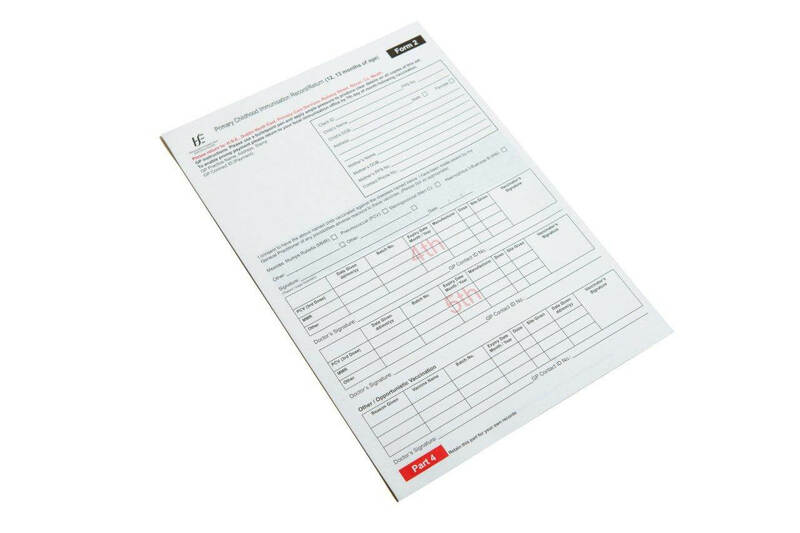 Printed NCR sets and forms are often used for invoices, delivery notes and hire forms and Hospital forms. NCR pads are ideal for paperwork on the move where you need multiple copies of the same document, all your NCR books can be personalised with a design of your choice, this can include your logo, your business details. We offer both NCR printing and design to suit your budget and requirements. We offer DL, A5 and A4 NCR pads and all come with a choice of 2 part (duplicate), 3 part (triplicate) or 4 part sets (quadruplicate), with identical single colour or full colour print to all parts. 50 sets per pad with white top copy, yellow 2nd part, pink 3rd part (if needed) and green 4th part (if needed). No messy carbon is required as we print onto NCR paper — No Carbon Required. All pads are glued and supplied with a grey hard board back and loose writing shield. We offer sequential numbering and other popular optional extras as required. We offer DL, A5 and A4 NCR books and all come with a choice of 2 part (duplicate), 3 part (triplicate) or 4 part sets (quadruplicate), with identical single colour or full colour print to all parts of our Printed Duplicate NCR Sets and forms — NCR books . We offer DL, A5 and A4 loose NCR sets and all come with a choice of 2 part (duplicate), 3 part (triplicate) or 4 part sets (quadruplicate), with identical single colour or full colour print to all parts. All parts are glued into sets and supplied loose with white top copy, yellow 2nd part, pink 3rd part (if needed) and green 4th part (if needed). We offer sequential numbering and other popular optional extras as required. Carbonless paper sheets for multipart business forms. Carbonless paper sheets for multipart business forms. Manufactured in CB (top sheet), CFB (middle sheet) & CF (bottom sheet). Pressure on the CB top sheet activates dye microcapsules which then form an image on the CF clay coated surface below. Stocked in white and tints to enable colour coding to be used in multipart sets. Please call 01 8423168 for a quotation.